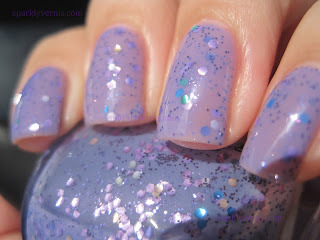 This franken is so pretty! I love the how delicate the purple looks. is that what your wall paper is? Hi :) this is my background http://www.sparklyvernis.com/2012/01/anna-sui-323-tiny-squares-lots-of-glow.html I haven't been able to change it, but if I could, I'd probably change it to this. So pretty! I really love this one. You reminded me that I need to make a post about this contest too... I completely forgot lol. Good luck! Thank you! Do it, yours is gorgeous!! I love lavender! Perfect for spring! !